Is it just me – or does it seem almost impossible that Thanksgiving is just around the corner? That’s right folks – so let’s do the countdown – 11 days until Thanksgiving and 44 days until Christmas. Well, at least the latter doesn’t sound that close… but still?! Close or not, we are so excited for Thanksgiving this year. We will be enjoying (almost) the whole family at our home… we’re talking l-a-r-g-e here. 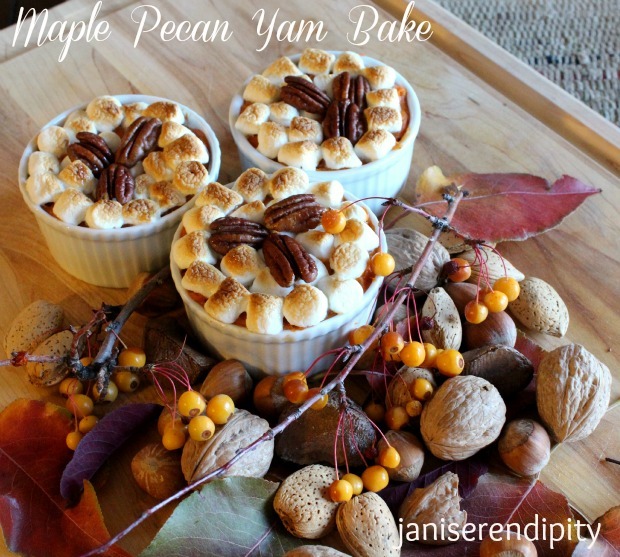 And if you asked any of our kids… Thanksgiving just wouldn’t be the same without HB’s own recipe, Maple Pecan Yam Bake! Of course the turkey, stuffing, gravy and pumpkin pies are a must. But this following recipe is seriously the best yam recipe I have ever eaten. And, of course I’m not biased! Notice the pierced fork marks; this is very important for the yam (or potato) to release steam as it bakes. 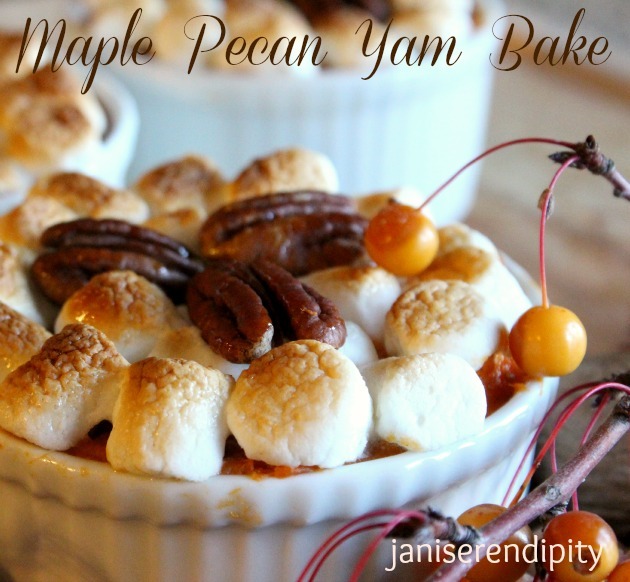 A fun job for the kiddies is layering on the marshmallows and then placing the pecans – just so! I promise you that this recipe will be a hit at your Thanksgiving table or any fall dinner you’re planning. 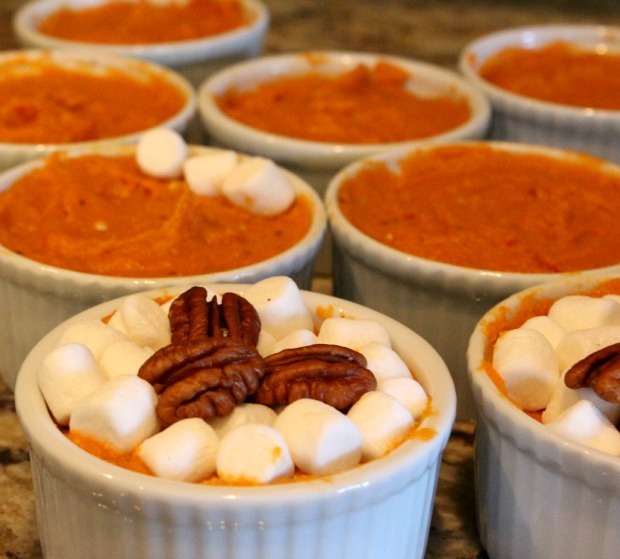 Your guests will love their individual ramekin yam casseroles! The best part about this dish is it’s super easy to make. Enjoy! 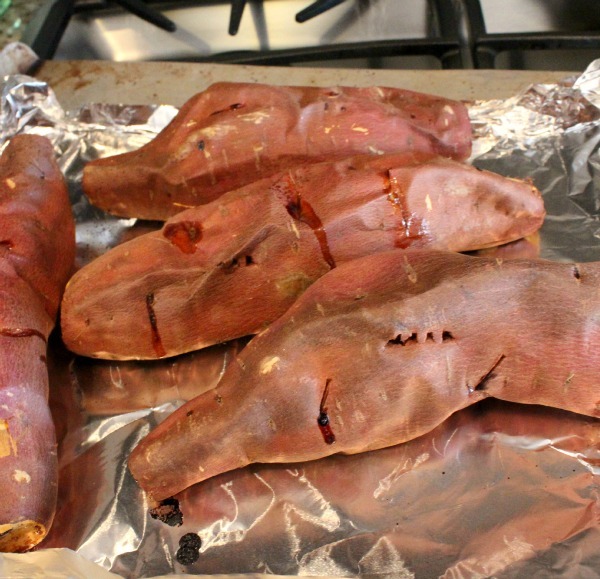 Just a quick note: If you decide to cook your yams the night before, make sure to melt the butter before adding it to the mixture and bake the ramekins or casserole for and additional 30- 45 minutes before broiling the marshmallows. I had this yesterday from your hubby and……DELICIOUS!! Thank you! 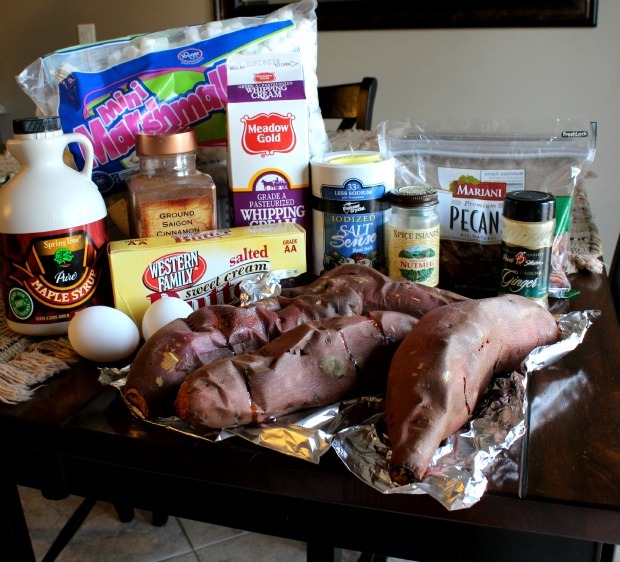 Trev is going to make them for Thanksgiving!! Wow! I can’t wait to try these! Pinning this! 😉 What an amazing side dish for Thanksgiving! Thank you so much! I love comments; so please come back for a visit! My heart just did a song and dance after seeing this recipe. Thanks so much for sharing and for linking up at the Thanksgiving Linky Party! Whoa, those look awesome. And I LOVE the individual portions, good idea!! Thanks, Marie! Can’t wait to see you!